Played with the Raspberry Pi’s for a bit, but I’ve found the Control By Web stuff while spendy to work VERY well. Haven’t had to reboot one yet and their Mobile App also works very well. 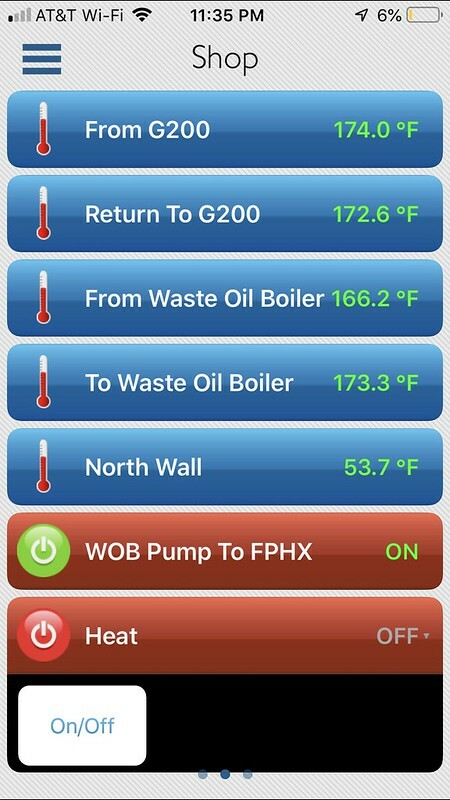 SO far have a X-300 in the shop monitoring temps and have wrote a script to control the pump between the waste oil boiler (storage of 450 gallons) and the G200. I had a Tekmar differential controller doing that and it took a dump, the X-300 cost less than the Tekmar and can do so much more. It has three built in SPDT relays, one is controlling the pump on the storage, the second I can turn on all the heat in the shop remotely and the third I’m going to write another scrip or maybe use the built in logic functions to control the ceiling fans in the shop. I ran a single run of of ethernet cable for all the sensors and SSR in the shop. You must use a SSR, a standard relay when it shuts off the collapsing magnetic field in the coil will create a voltage spike then the X-300 will drop sensors. Sometimes it picks em back up and sometimes needed restarted. Since SSR’s (solid state relays) have no coils, no voltage spike when they shut off. I simply bought the ones with a 3-32VDC input and used the same power supply thats powering the X-300 to power the SSR’s then simply wired them in to bypass each thermostat in the shop. Press a button in the app and all the heaters start, when it hits 60F they shut off, drops to 59 they restart. 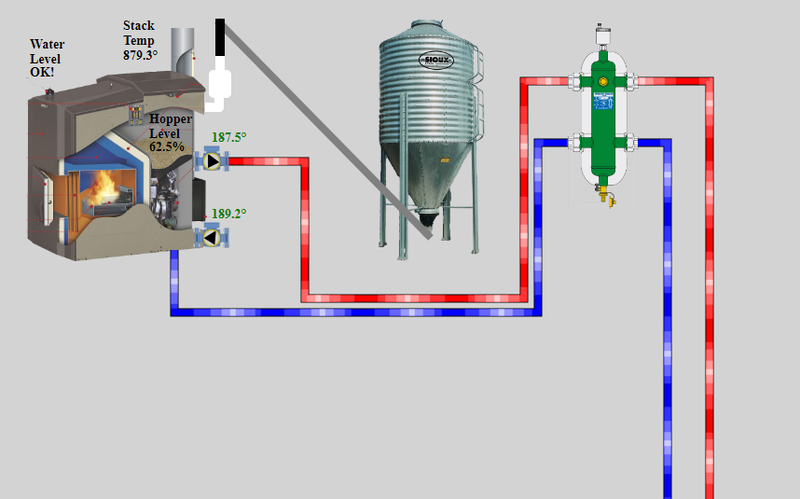 Also running a X-400 with a X13 companion module to read a stack thermocouple and a reaction chamber thermocouple. Have a X-410 in the basement, can start the snow melt remotely and if the temps drop low enough on the supply from the G200 it kicks a relay in to start the furnace secondary loop pump so the furnace can back feed heat to the boiler. I'm still chugging away with my Arduino and MYSQL solution for a web interface. It will be pretty good sized, 40-50 sensor points and similar amount of control points on the back end. I have begun coding the front end web app that reads the database information and has visual animations. Do the control by web devices have APIs or ability to harvest data without the app? Heres a link to the PDF manual for a x400, has all kinds of ways to communicate with it, most of it I’d rather slam my hand in a car door than mess with.